This exciting Defense of Crait LEGO Star Wars toy has everything a Resistance warrior needs to play out the epic final battle from Star Wars: The Last Jedi. The set features a highly detailed Resistance Ski Speeder with spring-loaded shooters, removable engine section, mini-figure cockpit and a lowering stabilizer. There's also a command tower with stud shooter on top and assorted weapons and tool elements, as well as a foldout trench section with rotating laser cannon and spring-loaded shooter, plus a gun emplacement with a stud shooter. Includes 5 mini-figures: Captain Poe Dameron, Admiral Ematt, a Resistance Trooper and 2 First Order Snowtroopers. 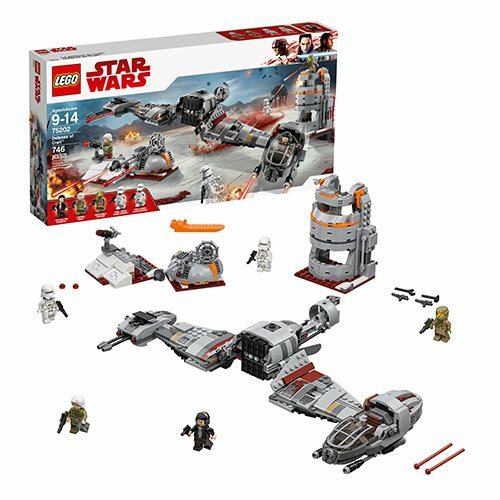 The LEGO Star Wars 75202 Defense of Crait includes 746 pieces. Ages 9 and up.